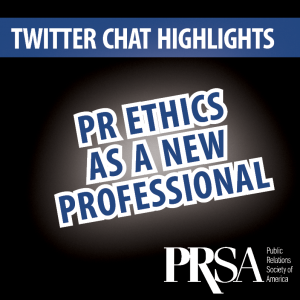 We’d like to thank everyone who participated in the September #PREthics Twitter Chat focused on how new PR professionals can handle ethical situations in the workplace. We discussed the importance of ethical practices as well as confronting unethical dilemmas and finding solutions. Specifically, we’d like to thank collaboration from PRSA, the Board of Ethics and Professional Standards (BEPS), and PRSSA for contributing to a lively discussion about this important topic. More information about BEPS can be found here. Join us again in October for our next #NPPRSA chat. What did you learn from the September ethics chat? How can you tell if a company is exhibiting ethical values? What can you do if a client or coworker is taking unethical actions? How can you always make sure your personal and company brands are ethical?